Donald Trump doubles down in immigration speech: "Mexico will pay for the wall"
PHOENIX -- Coming off the heels of a surprise visit to Mexico City to meet with Mexican President Enrique Peña Nieto, Republican nominee Donald Trump defiantly told supporters in Phoenix Wednesday night that Mexico will in fact pay for a wall across the U.S.-Mexico border. Trump’s speech came after a day in which his position on immigration — and in particular, his oft-mentioned border wall proposal — was put on full display. The GOP candidate reiterated his assertion that Mexico will pay for the border wall, despite the dust-up over the issue with Peña Nieto just hours earlier. In a brief Q&A session after their joint statements in Mexico City Wednesday afternoon, Trump said the wall was discussed, but that he and Peña Nieto “didn’t discuss payment of the wall”— but later Wednesday, Peña Nieto tweeted that he told Trump at the start of their meeting that Mexico would not be paying for such a wall. 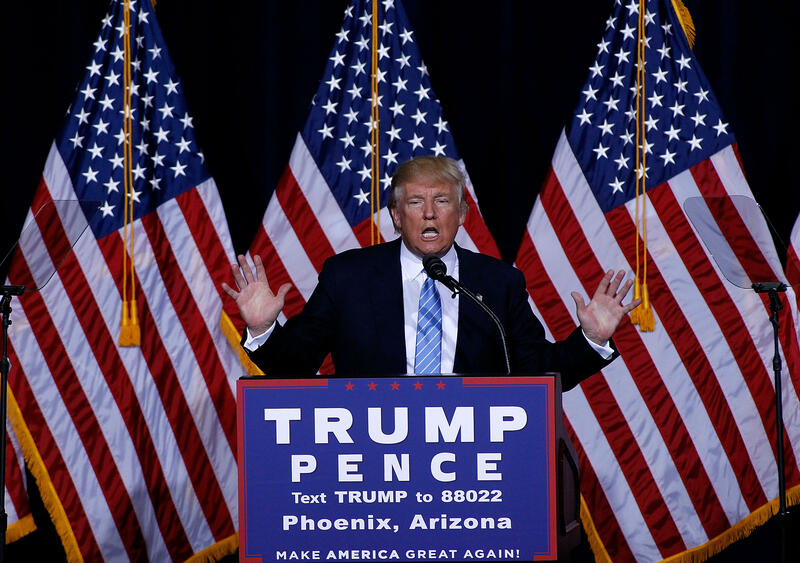 Trump’s Phoenix speech covered essentially no new ground policy-wise — but it was clearly intended to put to rest the notion that he might “soften” his position on immigration. In his opening, Trump spoke about the danger that the Obama administration’s “weak and foolish policy” toward illegal immigrants poses to American citizens. “Countless innocent American lives have been stolen because our politicians have failed in their duty to secure our borders and enforce our laws like they have to be enforced,” Trump said, telling the stories of U.S. citizens who were killed by people in the country illegally. He later illustrated that point by calling on stage a group of “Angel Moms,” women (and several men) who one by one spoke about their children being killed by undocumented immigrants. “While there are many illegal immigrants in our country who are good people —many, many — this doesn’t change the fact that most illegal immigrants are lower-skilled workers with less education who compete directly with vulnerable American workers,” Trump added. In addition to the border wall, Trump listed a series of policies he would undertake on immigration, including ending “catch and release” policies, enacting a “zero tolerance” policy on illegal immigrants who have committed crimes, blocking funding for sanctuary cities, revoking President Obama’s executive orders on immigration and use a biometric entry-exit system for tracking visa-holders. He accused President Obama and Democratic nominee Hillary Clinton of “gross dereliction of duty” when it comes to protecting U.S. citizens. “President Obama and Hillary Clinton support sanctuary cities, they support catch and release on the border, they support visa overstays, they support the release of dangerous, dangerous, dangerous criminals from detention and they support unconstitutional executive amnesty,” Trump said. Putting his policies in place will ensure “people know you can’t just smuggle in, hunker down and wait to be legalized,” Trump said. He also touched on his proposed Muslim immigration ban, which has since shifted to include residents of certain countries and which Trump has said will include a series of ideological questions to determine whether someone is a threat to the country. Since he first suggested that “softening” earlier this month, Trump has worked to clarify his muddled statements about immigration: at one point he suggested the U.S. government could “work with” people who are already in the country illegally, only to say less than a day later that he was not in favor of citizenship for undocumented immigrants.